Integrating architecture with landscape is the major theme of this residence in Hastings-on-Hudson, New York. The new 1,830 square foot two-story extension adds another segment to the boomerang-shaped house, its linear and angular floor plan designed to maximize views of the Hudson River and Palisades. The original house, built in 1961, has a long glass façade and deck allowing all bedrooms and main living areas views and access to the outdoors along the western façade, with kitchen and bathrooms on the eastern side. The new structure, consisting of a dining room extension, home office, guest bedroom, and bath at the first floor, and master bedroom suite on the second floor, is designed to capture panoramic views of the river and the wooded property. While inspired by the mid-twentieth century elements of the original house, the new extension utilizes these elements in a more dramatic way. The somber repetition of the original modular glass panels is broken by a two-story glass atrium, providing a transition between old and new. At the corner of the atrium, the extension angles 147 degrees for ideal northwestern river views. Staggered cantilevered glass and cedar walls wrap around the southwestern corner, to create a sense of motion. A dynamic counterpoint of movement is expressed in the new roof canopy, sloping upwards at the western façade to allow the glass wall to rise to twelve feet, and overhanging four feet to provide shade from the western sun. The cedar railing, based on the original design but modified to have more horizontal members to meet current codes, provides a textural element that overlays the expanses of glass. In a similar manner, a new cedar trellis on the eastern façade - with details to match an existing brise soleil - throws dappled light and patterns of shade and shadow onto a wall of vertical cedar siding. Interrupted rhythmic geometric patterns lend an organic sensibility to the design. Exposed rafter tails and trellis members have tapered edges; horizontal railing members are offset from vertical supports; the original chimney, made of rock-faced roman size brick, has an asymmetrical shape with irregularly projecting bricks. This twenty-foot long wall has been preserved and treated as a major sculptural element in the atrium. A new stair, which replicates the natural wood dowel and plank design of the original stair at the foyer, runs alongside this brick expanse. The glass walls surrounding these features have a staggered muntin layout, departing from the predominant rectilinear pattern and horizontal lines of the original house. These elements are punctuated by a large oval George Nelson pendant light, creating a collage of texture and compelling forms. 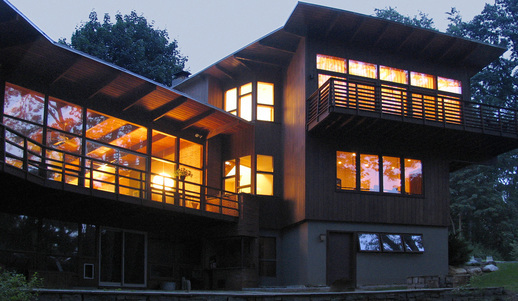 The house is an example of architecture influenced by International Style and Wrightian concepts, synthesizing innovative design with the use of natural materials. This imbues the structure with a warm modernist sensibility, creating a home that is at once conceptually engaging and eminently livable – a combination which will keep its owners elated as well as comfortable for years to come.